When it comes to my beautiful Byer of Maine Hanging Globo Chair, it was definitely a case of love at first sight. 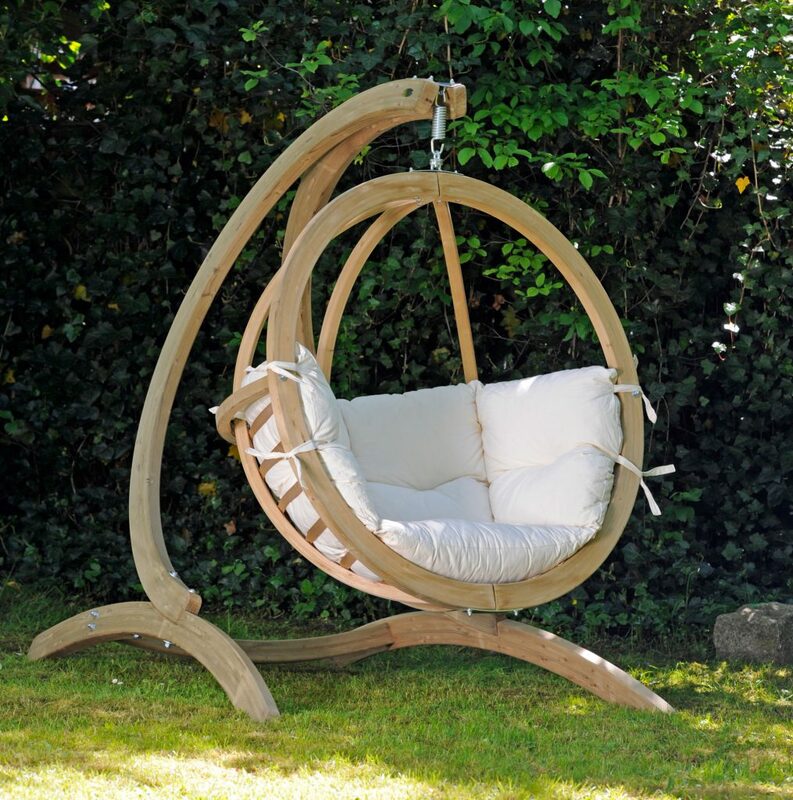 I had mentioned to my partner that I wanted to put a big, comfy chair underneath our giant backyard shade tree, and I wound up ordering this one that same night. Ten days later, the chair of my dreams had gone from a fantasy to a massive assembly project that tested our teamwork and our love for each other… but don’t worry, he’s forgiven me. 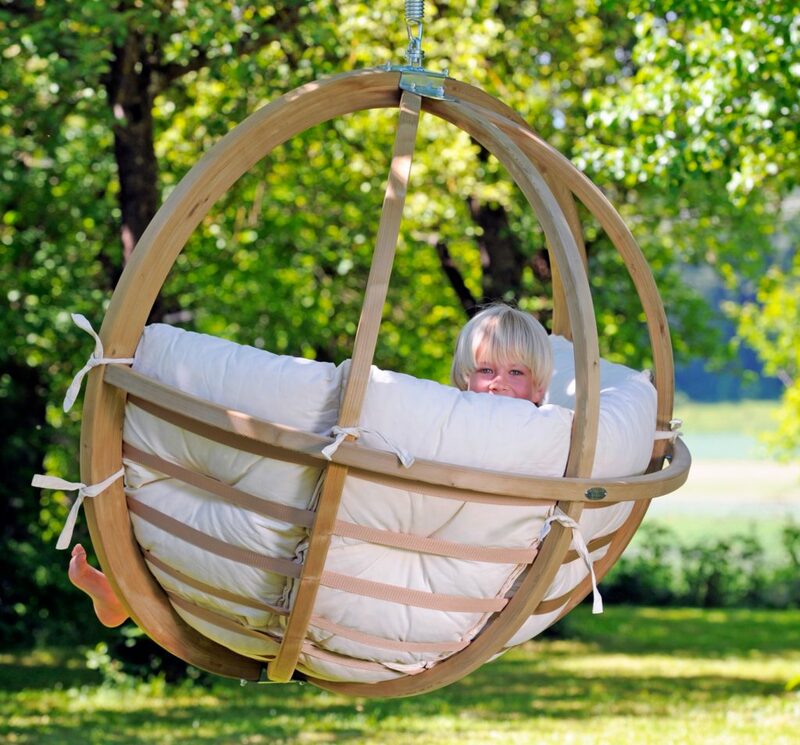 It’s impossible to stay mad at me when he’s relaxing in our wonderful new Hanging Globo Chair! 2 BUY IT OR NOT? 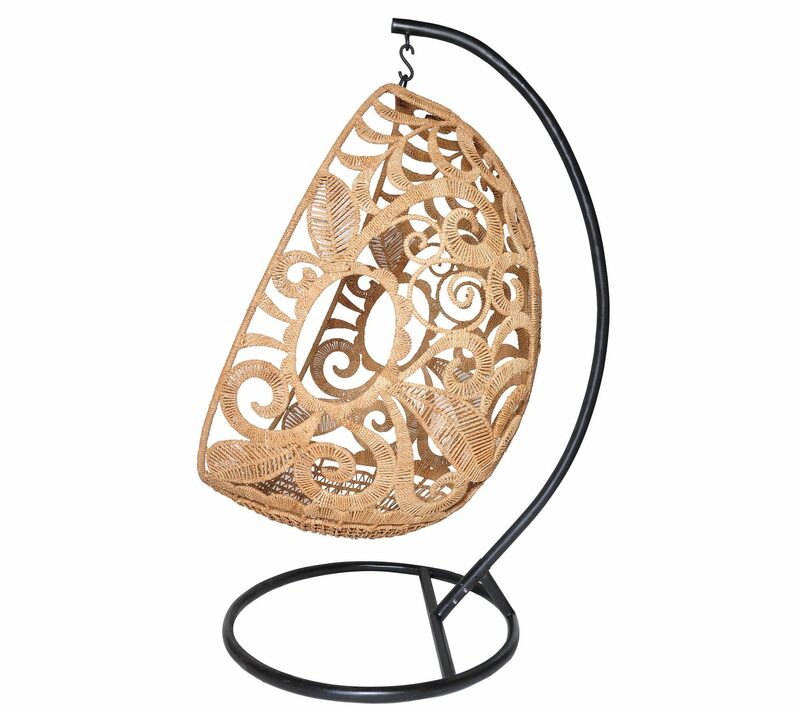 This is a rounded, ‘globe-shaped’ hanging chair that works well for both indoor and outdoor use. It measures 48 x 48 x 30 inches, which makes it cozy yet spacious enough to comfortably fit people of all shapes and sizes. The assembled chair weighs in at a total of a measly 31 pounds, but boasts a maximum weight capacity of 440 pounds. The unique round frame is made of strong, weatherproofed spruce, which ensures optimal stability. The burst of color comes in the form of the soft, squishy, Agora cushion. This cushion is available in three colors: Green Agora, Natural Agora, and Terracotta Agora. As I mentioned, the Hanging Globo Chair’s comfiness made my partner love me again after I forced him through the drudgery of furniture assembly. 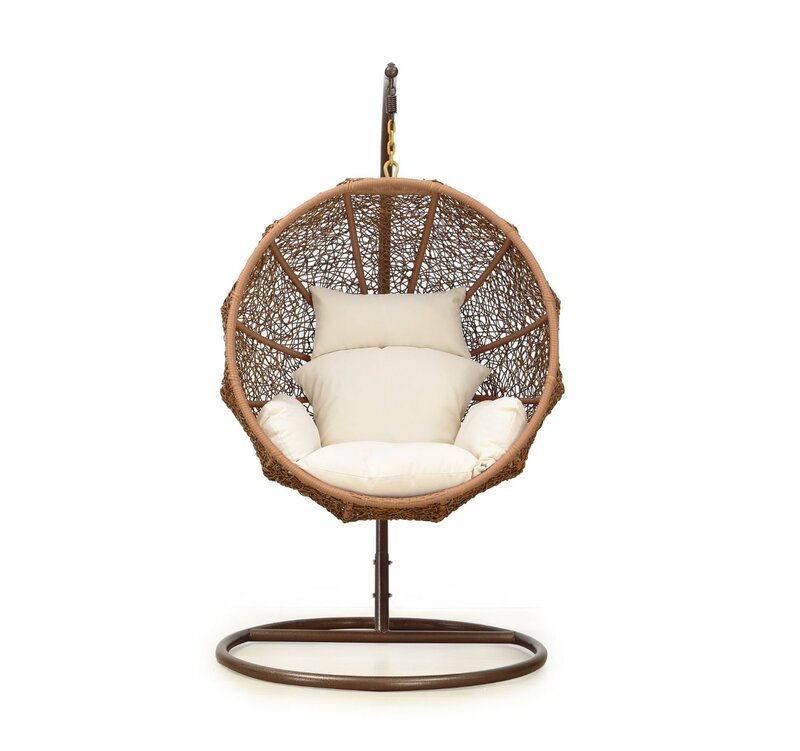 This is the most comfortable piece of furniture I’ve ever owned– if not for the mosquitoes, I’d consider moving out of my bedroom and into my cozy little hanging chair. It’s soft, it doesn’t get hot, and it’s roomy enough to allow for all the fidgeting and changing positions that come with reading for hours on end. The rounded frame cups your body almost like a bowl, allowing you to melt into the cushions like hot fudge in a waffle bowl. It’s not just comfortable: it’s beautiful, too. I chose the natural colored cushion, which looks gorgeous against all the greenery in our backyard. The rounded frame and stand are so unique, fun, and cute… even from behind. Looking out at my Hanging Globo Chair feels like getting a glimpse into some fun fantasy world full of elves and fat, jolly gnomes who have a penchant for yard furniture. The wood is strong and weatherproof, but it looks beautiful, elegant, and almost whimsical. All while being sturdy enough to hold me plus two squirming nieces. It was a tight fit, but our Hanging Globo Chair performed valiantly. This chair is pretty, but it’s also a force to be reckoned with! The biggest pro for us has been its durability. It’s in almost constant use, and it’s been hit with both rain and strong sunlight pretty regularly, but it hasn’t yet shown any signs of wear. Despite the hardships of being outside, it’s held onto that beautiful natural color that I love. I haven’t noticed any damage on the wooden frame, either, so it appears to be squirrel-proof. The chair is pretty versatile, too– at first, we hung it with a suspension kit from one of the tree branches, but now, it’s hanging from a stand. It has worked well both ways, but for the sake of stability, I recommend purchasing the Globo Stand. The only big con for us was, as I previously alluded to, the assembly process. All of the pieces were included, but my partner and I really struggled to get this put together. It took us a while to get the frame assembled, but the hardest part was getting the cushions stuffed into the cover. There had to be an easier way to do that! Despite the assembly struggle, my partner and I definitely recommend this chair! It’s beyond comfortable, it’s like a floating on a cloud! It’s sturdy, and it weathers the ups and downs of outdoor life without a problem. We get compliments on our Hanging Globo Chair every time someone walks into our backyard, and it’s always the first seat taken during gatherings. 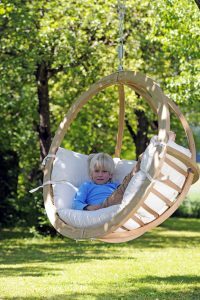 There are a ton of outdoor swing chairs out there, but if you’re looking for something of the same caliber, the Globo Royal Chair by Byer of Maine is another option. 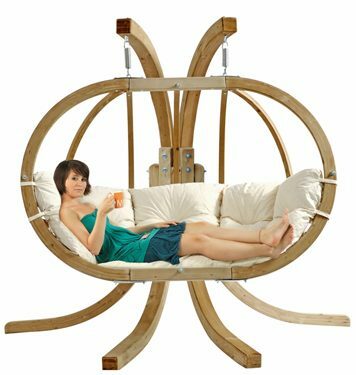 It’s pretty much identical to the Hanging Globo Chair, except twice as big, so you and your partner don’t have to play rock, paper, scissors every time you want to sit in it. 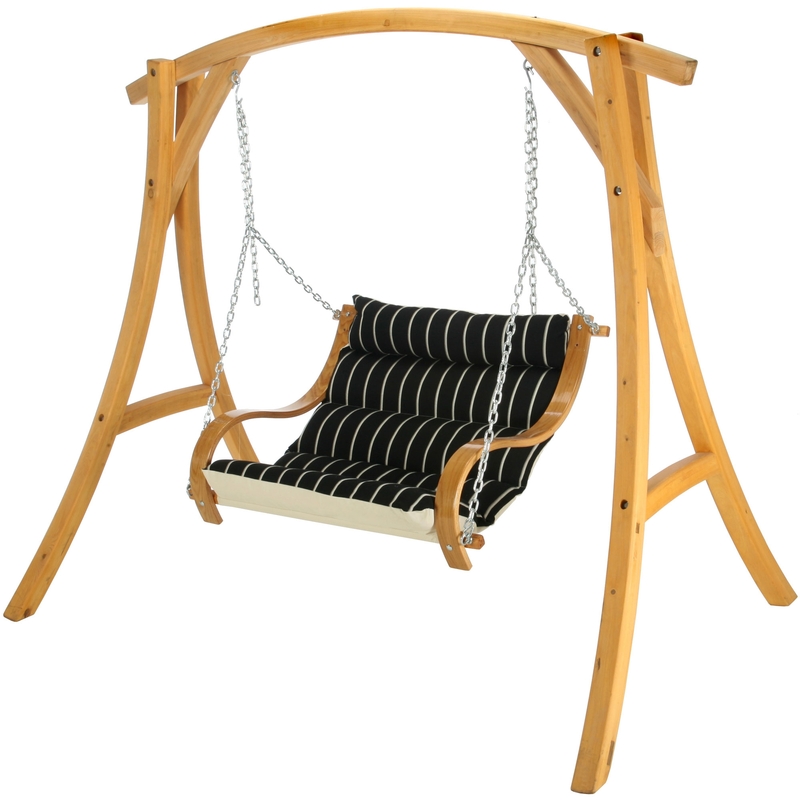 The Swing Chair with Stand by Island Bay (our review) is another, though much smaller, option.